In case you hadn't heard, the Auburn Tigers and Wisconsin Badgers are facing off in the 2015 Outback Bowl this Thursday. That's important info even if you've never set foot in Auburn or Wisconsin, because the victor will determine which free app you can order at Outback Steakhouse the next day. Should the Tigers triumph, it's free coconut shrimp on the house. 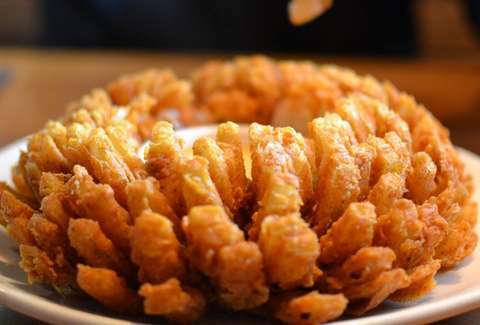 But if the Badgers win, you get Outback's signature Bloomin' Onion. (Nice work, Badgers lobbyists.) You just need to say "Outback Bowl" to your server on January 2nd to score your free app, regardless of outcome. The match is on ESPN2 at 12pm EST on New Year's Day, so you should probably fashion your fight signs now, since we imagine you'll be well into the "old man body aches" stage of your NYE hangover when the 2015 Outback Bowl kicks off. Kristin Hunt is a Food/Drink staff writer for Thrillist, and guesses she's a Badgers fan for this week. Follow her at @kristin_hunt.